Narrative Description: Because the first and last part of this paddle includes the St. Johns River, attention to the weather and wind conditions is prudent. Stay near the shoreline until reaching Rice Creek. Rice Creek and Etonia Creek are narrow and canopied waterways. There are a lot of native plants and animals – alligators, turtles, herons, Bald Eagle, vultures, kingfishers, snakes and hornets. Brushing against blow-downs and hang-overs should be avoided. The landing is located on the right side of Estonia Creek. It is concrete and there are no facilities. The mouth of Rice Creek is 1.5 miles north of the Crystal Cove Marina on the western shore of the St. Johns River. Rice Creek is a main tributary in the St. Johns River and Etoniah Creek branches off Rice Creek at the Georgia Pacific plant. This was once one of NE Florida’s most polluted waterways but has been restored to a healthy and enjoyable paddling trail. Highway 17/19 is a 4-lane bridge over Rice Creek 1 mile from the mouth. Etoniah and Simms creeks are narrow and can be swift depending upon rainfall. These tributaries are historic creeks into the Bardin community and are largely unpopulated because they are surrounded by wetlands. 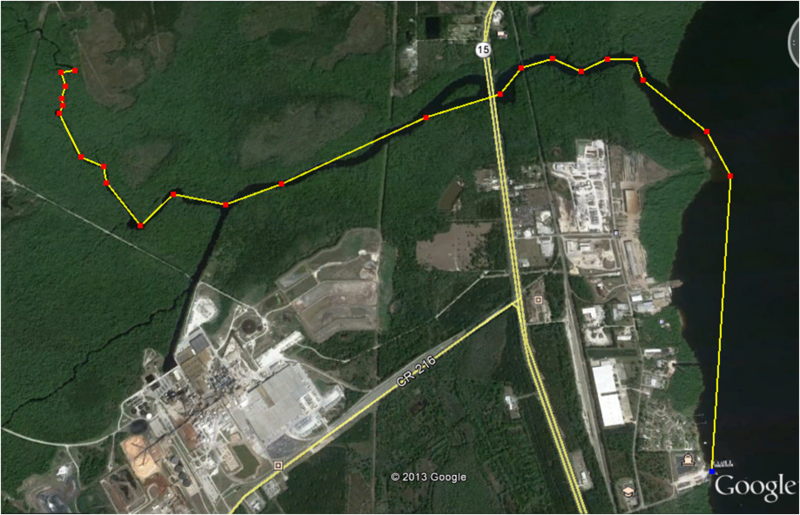 The Etoniah Creek is a long tributary that flows from as far away as Florahome, some 10 miles west. This creek flows through the Etoniah State Forest.